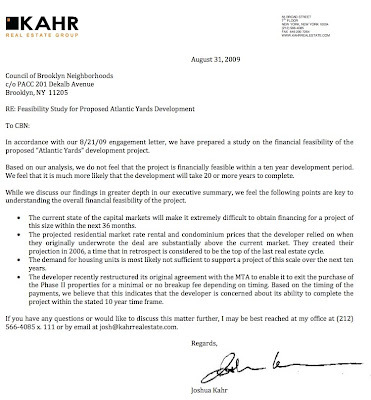 Now that we know the KPMG Atlantic Yards market study for the Empire State Development Corporation (ESDC) takes a far more optimistic approach than the report by consultant Joshua Kahr for the Council of Brooklyn Neighborhoods, the question is: did KPMG consider Kahr? "Can you explain, did the KPMG report respond specifically to the Joshua Kahr report?" I asked ESDC Senior Counsel Steve Matlin after the September 17 ESDC board meeting. Well, as the screenshots below show (click to enlarge), they were both dated August 31, 2009, so there was no way KPMG could officially consider Kahr's conclusions. Nor are there any references to Kahr's report. Perhaps KPMG looked at the report after the fact. Given that KPMG's report was delivered to the ESDC board for a September 17 board meeting, presumably it could have been updated to address Kahr's conclusions--though that may have been a knotty problem. 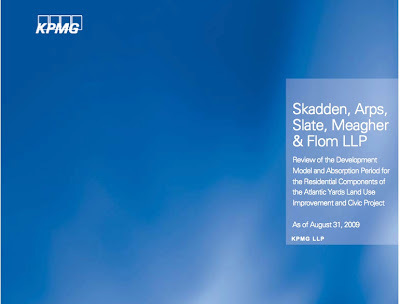 Had it been released before August 31, presumably Kahr would have tried to address KPMG's conclusions. Perhaps we will see the two reports dissected in court.